No wonder Elvis was so fat and died so young, eating junk such as this! Shame on him! If someone was to create a bacon banana split .. it had to be you! You did not top that banana split with bacon!?! Only you can make that look good.. :) Last night on cupcake wars, they used bacon on/in several cupcakes. I so thought of you as always! Miss you and Mr. How Sweet. how do i think for some reason this would be REALLY good?!?!??! Bananas and peanut butter were meant to be together. No doubt about it. This looks outrageously good. Wow! Elivs might the be the king but he has got nothing on you!!! There’s no way this could NOT taste good!! haha I love you and all your uses for bacon! Woooooooahhhhhhhh, that actually looks reeeeally good!! 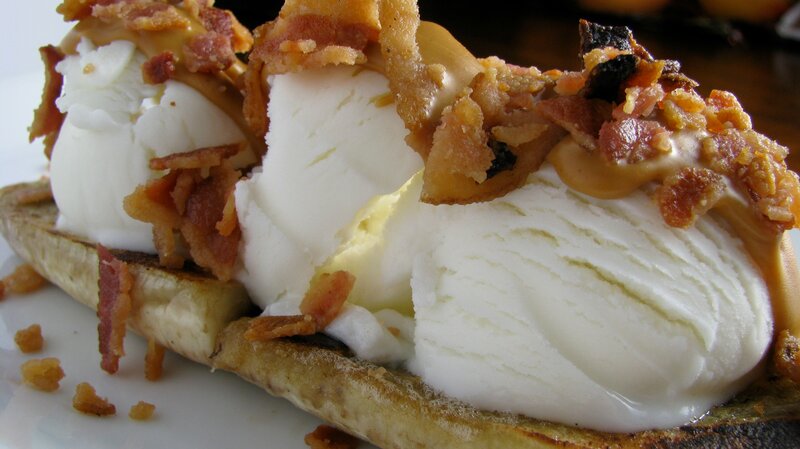 Never would have thought to put bacon on a banana split, but I’d totally eat it!! LOVE THIS!! My husband is drooling over my shoulder! Genius! I bow down . . . I don’t know if I’m brave enough to go for this, but I’m sure it’s incredible. Salty, savory, and sweet? Amazing. I never would have thought to do that. How did it taste? Loving this!! You know we’re fans of the bacon/peanut butter combo…and adding the caramelized banana…oh my my my…we’re in love! Wow! Your love for bacon is truly unbounded! You and your bacon :) I don’t think I could stomach this (even if I were a meat eater), but it still looks great! You can’t HANDLE the bacon! PS: Why does the title say “Electrolux #splits: The Elvis Banana Split.”?? We had to post it that way for Foodbuzz. I know, funky isn’t it? This is a reminder of why I love you. Delish. Ohmygod. So decadent! This looks delicious and I don’t even love bacon (sacrilege, I know). Haha. Great cause too. I think my husband would think he died and went to heaven with this one! You are so bad…in a good way! I love that you went there with the banana split! I have to tell you, there is a restaurant near my house that serves a speciality margarita with bacon cumbles around the rim. I thought of you! What?! I need to come visit. What is the margarita flavor?? It’s a bacon pineapple jalepeno margarita! They also have a BBQ bloody mary that gets served with a rib – no joke! It’s a comfort food restaurant! Visit? Heck, now I’m ready to move in! Never heard of ice cream and bacon combined…But I love both! Oh my! I’ve never had some of the combinations you’ve made in this creation before, but I’m sure they’re great. Good luck! No! I can’t handle it! Oh my lord my hips are getting wider just looking at it. I actually do love the combo of banana and PB and bacon… but never thought of it as a ‘split’. How fun! This is awesome. It just so had to be done. I don’t care for banana splits because of all the fruit, but i could get into this one. Actually it looks pretty darn good! I love sweet and salty! Great pictures too…looks so decandent. I think this is the perfect banana split for you!!! wow, it looks good! I love the sweet and salty combo heaven.